Several years ago I had a story idea that went something like this: The protagonist was a young mother in a society that had (d)evolved into one in which, by law, couples were limited to a certain number of children ~ while birth control of any kind was illegal. And if, in the world of this story, one did have too many children? Then one had a certain amount of time to surrender the “extra” children to the local “welfare” office, thereafter to be processed and sent to a “relocation” center ~ kind of like sending concentration camp prisoners to the “showers” in Nazi Germany. I didn’t write it for two reasons. The first was that the idea was horrifying. It had come to me in a stress dream, and it was indicative of my state of mind at the time as a single parent trying to raise 4 children on little more than the faith of a mustard seed praying for loaves and fishes (and school clothes would have been nice, too). The second reason I didn’t write the story was really paramount though ~ I could have overcome the first, if only to see where the story would take me. But I didn’t write it mainly because I didn’t think there would be a market for it (even if I had had the first clue where to look for a publisher). Who would buy, in either sense, a story about a society in which human beings just like us would allow even one of their children to be taken ~ who would, indeed, obediently offer up their children to be killed ~ just because it was a law? The idea seemed ludicrous. True, there are many stories and movies of dystopian societies that sacrifice, both figuratively and literally, their freedom and their citizenry for one reason or another. The Running Man? Sure. 1984? Right. Even “The Lottery.” No problem. Because, even in the last instance, the sheep to the slaughter are grown-ups, adults who at least have age and experience and the choice, no matter how austere the alternative, of whether or not to participate in that society and be governed by its laws. Well, as one of S.E. Hinton’s characters so memorably said: That was then. This is now. Apart from the first chapter of the first novel that I downloaded as a sample, I haven’t read The Hunger Games novel on which the movie is based. However, having seen the movie, I think Suzanne Collins, and I must be sisters under the skin. The main difference is, she’s a much younger sister, a sister of a whole other generation. Collins grew up during an age in which such a scenario seemed more than plausible. She is of the generation raised on so-called reality TV ~ television shows, in prime time, that seemed designed to dismantle the system of values that we have long prided ourselves on teaching our children, values of honesty and fairness and compassion for one’s fellow humans. I don’t know what the original idea was behind Survivor and Big Brother (and you know where that name came from, don’t you?) and others of their ilk, but what these weekly TV shows rapidly became was object lessons in the values of whoever-lies-and-cheats-the-best-lasts-the- longest. These shows pitted people against each other, encouraged two or more to form alliances ~ and then made it impossible to “win” without betraying that trust and turning on each other. Each week, and with each “new” reality TV series, supposed adults reenacted, for the entertainment of the television audience, ever more cruel and debasing versions of Lord of the Flies. Small wonder, then, that the premise of The Hunger Games became not only plausible but well received by young adult and adult audiences alike. It doesn’t hurt anything that the story, like most dystopian fiction, is set in the future and elsewhere, either. We can allow for and even enjoy the premise of a far distant society full of people who let the government take 24 of their teenaged sons and daughters every year and put them to death at each others hands ~ because, while such a thing could surely happen, nothing like that could happen here, in our society. It occurs to me that the above makes it appear that I didn’t “like” The Hunger Games, when nothing could be further from the truth. In fact, the movie was so well done, the characters and storyline so compelling that, even though the movie was complete in and of itself, I won’t be satisfied, now, until I read the books. Much about the movie is well done, including setting, costuming, and camera work, as well as the actors portrayals of characters, key and low key. Lenny Kravitz, for example, turns in a stunning portrayal of Cinna, making the most quiet, low key scene into an emotional gut punch by mere expression or muted gesture reminding us of why he’s staging these young people in the first place, while simultaneously providing a near perfect foil for Woody Harrelson’s Haymitch. Equally effective, in a more chilling, where’s-the-exit-again? way is the incarnation of the aptly named Caesar Flickerman (Stanley Tucci), the over-the-top host of the televised Hunger Games. To say this guy has mad skills would be much too ironic, not to mention an understatement. 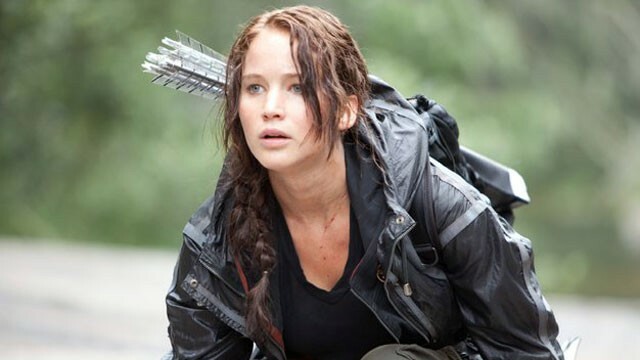 But what makes the movie a success, ultimately, is the heroine herself: Katniss Everdeen. When you see the movie, you’ll find the camera work in the early scenes disorienting and disconcerting, but once the focus comes to rest on Katniss Everdeen, everything becomes steady, implying that in this reality nothing is certain or sure, no one steadfast, but Katniss herself ~ and that first impression is, itself, consistently demonstrated through out the movie, in Jennifer Lawrence’s portrayal of Katniss. There’s a point, after they’ve been selected and taken to the Capitol, when Peeta, the male “tribute” from District 12, tells Katniss that, while he fully expects to die in the games, he wants “them” to know they don’t own him, that he doesn’t want to be changed by the experience into something or someone he’s not. 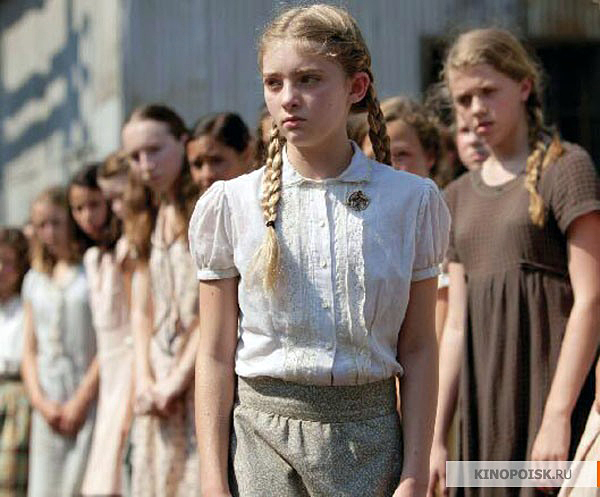 Yet, from the moment she volunteers to take her little sister’s place as the female tribute in the Hunger Games through her clear relief that Gale (Liam Hemsworth) isn’t chosen as the male; through her unspoken but obvious decision to simply do her best to survive as long as possible, rather than joining forces with the likes of Cato (Alexander Ludwig) and his group to kill off the other tributes; to her final choice to cheat “them” of their winner ~ it is Katniss who, ultimately, remains true to herself. It is her repeated refusal to compromise her personal set of values, even at the cost of her own life, that holds us all in thrall ~ and that thralldom, itself, shines with hope for the real life future that will be molded by our teens. 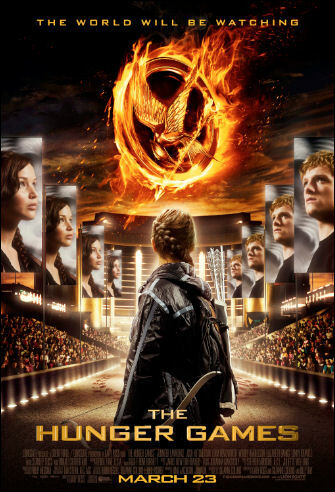 The popularity of Katniss Everdeen and The Hunger Games illustrates that somehow ~ in spite of the culture of “reality” TV and the shifting sands of uncertainty that have become the hallmark of some of our “advanced” societies and governments ~ there is still something within some of us (apparently a lot of us, to judge by the box office) that believes in and aspires to the ideal. 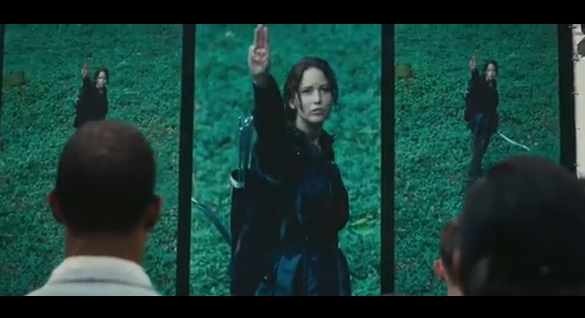 We, including our teens, are drawn to Katniss because she embodies that ideal ~ she is that person of honor and valor and indomitable spirit who may be maimed, broken, even killed, but who, having chosen the moral high ground, will not be moved. That’s a shining beacon of hope if I ever saw one. Rebecca Longster is a writer, an avid reader, and just generally addicted to words in a row. In addition to writing fiction and non-fiction, both for the web and for print publication, she currently teaches writing at Purdue University in West Lafayette, IN and lives “across the river” in Lafayette, with her husband, James (artist, photographer, and renaissance man) and two crazy kitties. You can get in touch with her at Rebecca@RenaissanceWomanInk.com or visit her website of the same name (currently under reconstruction). This entry was posted in Books and Literature, Reviews, Science Fiction, Uncategorized, Young Adult Literature and tagged Hunger Game, Jennifer Lawrence, Josh Hutcherson, Katniss Everdeen, Lenny Kravitz, Liam Hemsworth, Suzanne Collin, Woody Harrelson. Bookmark the permalink. You’re spot on with this review, and the book ends up being even more intense. Katniss shines even more once we’re in her head.